In my ongoing process to talk about great books that you may have missed and to talk about making comics or how to learn to write comics or learn to draw comics, I'm tackling some really good work in these "The Good Books" posts. 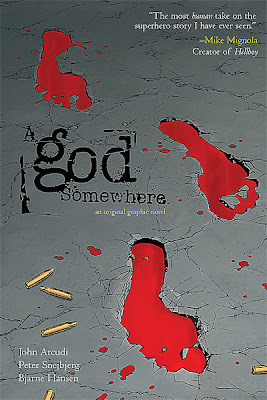 Today's is A GOD SOMEWHERE and it's written by John Arcudi and illustrated by Peter Snejbejerg. It was released last year (2010) by Wildstorm. The book itself has an intriguing cover that implies a contemplative approach to a dark super hero tale. It also implies that this is going to have some horrific bits in it. From a cover construction stand point, I think this one picture says everything the publisher would want a customer to read into it. Take a look. I think it's fantastic. I haven't followed Peter Snejbjerg's (something I now plan to remedy) work over the last few years, but I have kept an eye on John Arcudi. 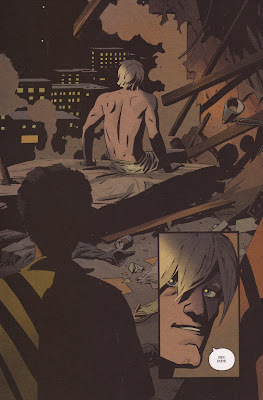 Arcudi has written steadily for the last 10 or so years in the comics industry and has turned out some really brilliant work and has, in my opinion, never received the kind of credit he deserves for his creative talents. If you're not familiar with his work, I'm not surprised. But the fact is, you should be. A GOD SOMEWHERE is my favorite thing that I've read of his. The concept is simple. An ordinary human who is much like many of us. Not a bad guy at all, but certainly flawed, is imbued with strange and wondrous powers. Only in this world, he's the only one who has them. The journey that Eric undergoes through the course of the book is not an unfamiliar one. Unlike the super heroes in other comics, he doesn't instantly get imbued with a strict and unshakable moral code. He remains one of us. And as his power grows, it distances him from the rest of us. I found myself thinking about celebrities in our own society. So rich, so powerful, so scrutinized, and surrounded with timid people, that they slowly lose touch with who they once were. I don't think Tom Cruise started his career off as the kind of guy who would jump up and down on Oprah's couch. Nor was Charlie Sheen likely the ego-maniac that we've come to see of late. These are the results of someone never hearing the word no or always being able to change it if he does. I'm over simplifying just to illustrate Eric's journey. His journey is one of disconnect. As he becomes more powerful, more guarded, and more influential, he slowly loses touch with his own humanity. And begins to suffer delusions that he may be a god. It sounds, as I write this, like an over-the-top blockbuster, but the thing about this book that makes it so good is that it remains grounded at all times. Arcudi's script keeps us focused on real people as much as the almost all-powerful Eric. His script does not hamstring the evolving character with super hero tropes about morality or justice. It's about a guy who becomes a god and what that does to the guy's mind. By coincidence, just last night I read "Battlefields: Dear Billy," and was thinking about how extraordinary Peter Snejbjerg's art is in it. It's also, in my opinion, the most powerful thing Garth Ennis has ever written, so I'd recommend checking it out to see more Snejbjerg's work. "A God Somewhere" sounds like a great concept, with two very talented creators at the helm. Thanks for the recommendation. My favorite thing by Garth is 303 published by Avatar. Check it out if you haven't. Cool. I'll definitely check that out. Thanks.